Can you tell me where city cafe is located? The prize for April is one of my Tote bags, available four designs. Printed right here in Scotland. Each one is a machine washable 100% cotton tote, screen printed with one of my sketches. If you would like to buy a set of my totes (now all £7.50 plus postage) then you can order one here from my Etsy shop. #WhereArtI Answer – April 1st: An old favourite of mine, this cafe on the Meadows is Victor Hugo’s Deli, Melville Terrace. Sally Anderson was randomly picked from the correct answers to go into this month’s prize draw. Thanks for playing, more next Monday. Is it Victor Hugo at the meadows? It’s Victor Hugo’s deli on Melville Terrace. That would be the Victor Hugo deli on Melville Terrace at the back of the Meadows. Lovely place for a coffee. 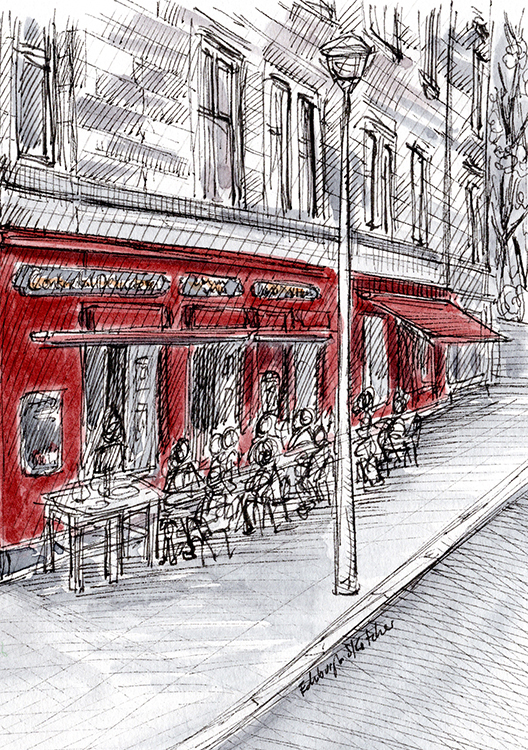 The victor hugo cafe at marchmont – fantastic place and amazing sketch of it really captures the atmosphere of the place! I’m going for Cafe Rough on Fredrick St?